I’m all geared up and ready to go! Dr. B and I are driving to Gainesville tomorrow morning for the Florida vs. Tennessee football game. Although this is the 3rd game of the season, This will be the first real test for the Gators against a team in the SEC. This should be a great game, both teams are 2-0, although Florida is ranked 16th in the AP poll. In addition to the game, the College of Journalism and Communications is having its annual alumni reunion tailgate before the game. It will be great to hang out with old friends, eat some BBQ, and talk Florida football!!! Dr.B. 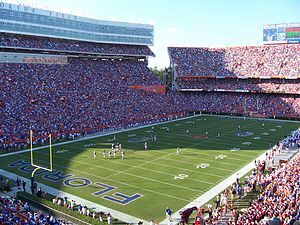 and I are driving up to Gainesville on Saturday to watch my alma mater, the University of Florida (UF) *Go Gators*, beat up on LSU! This should be a very good game. Last week in the AP poll Florida was ranked #7 and they were crushed by #1 Alabama. After that loss, Florida fell to #14 and LSU moved up to #12. They are will battle it out in the Swamp, which is the nickname for Ben Hill Griffin Stadium. Hopefully UF will win so we can move up in the poll. This will be the first UF football game Dr.B has ever attended. I told him he is now officially a Florida Gator, whether he likes it or not 🙂 He bleeds orange and blue just like I do! The game doesn’t start until 7:30, but were going to drive up early Saturday morning and tour the campus on our bikes. I’m looking forward to showing Dr. B the campus where I spent four of the best years of my life. Then at 5:30, were going to tailgate with my fellow alumni at the College of Journalism and Communications. The college is right across the street from the stadium, so it will be a rowdy tailgate….you know who wild and crazy journalism students are. lol! Any big plans for the weekend? Any college football fans out there?